As part of a $214 million expansion, the Aventura Mall now boasts a 93-foot-tall slide, per the Miami Herald. The slide is part of the mall’s first phase of expansion, which is designed to provide entertainment beyond shopping. 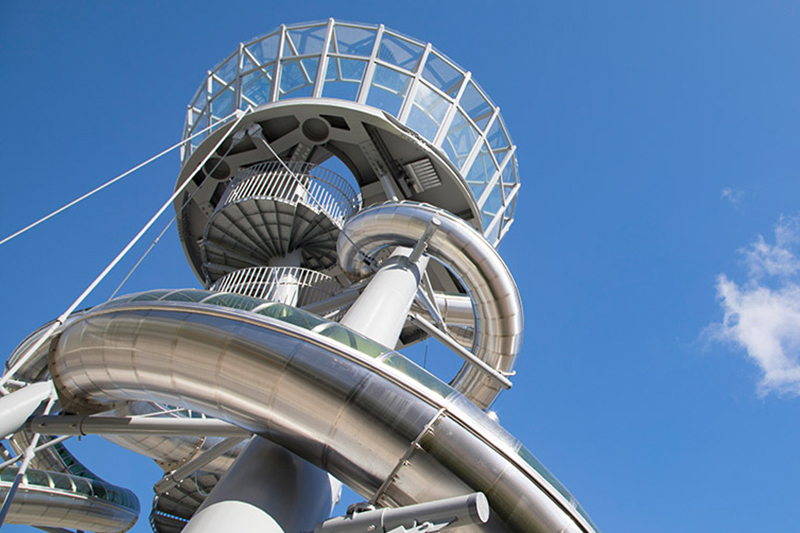 Called the “Aventura Slide Tower,” it was designed by Belgian artist Carsten Höller and the Miami firm Permuy Architecture. In addition to being an attraction of its own, it also marks the entrance to the new 315,000-square-foot wing. The three-level wing will include a food hall, a covered parking garage, art installations, and several new, world-famous tenants. It is fronted by an 84-foot by 50-foot glass wall and topped by a 350-foot skylight that allows sunlight to shine down to the ground floor. The new Treats Food Hall, which occupies the third floor of the new wing, will eventually feature a dozen restaurants. Luke’s Lobster is already open and opening soon are My Ceviche, Shake Shack, Zuuk Mediterranean Kitchen, Figs by Todd English, Hank & Harry’s, Poke 305, GOGO Fresh, Sliderz, The Bol, and Haagen-Dazs. Three other restaurants are already open in the wing’s outdoor plaza: Genuine Pizza, CVI.CHE 105, and Blue Bottle Coffee. Tap 42, Pubbelly Sushi, Serafina and Rosetta Bakery will join them by spring of 2018 when all the eateries are expected to be up and running. Other additions, such as a rooftop garden and a 7,000-square-foot VIP lounge available for private events, will also be completed next year. The slide and the broader expansion is aimed at boosting sales. Like brick-and-mortar retail venues across the country, the Aventura Mall has been grappling with declining sales. According to the U.S. Department of Commerce, department store sales have dropped by 40 percent since 2000, from $100 billion to $60 billion. National chains such as Sears, Kmart, Radio Shack, Payless Shoes, and HH Gregg have either shuttered locations or gone out of business altogether.